In one lunchtime walk yesterday, I saw both the past and future of retail. “As seen on TV.” Seriously, they still use this tagline to hook people in? Does it still work? It’s never the name-brand products which used this — always the slightly dodgy ones. I walked past this display twice, and saw nobody actually looking. Perhaps they do when there’s a shouty person with a microphone spruiking it. 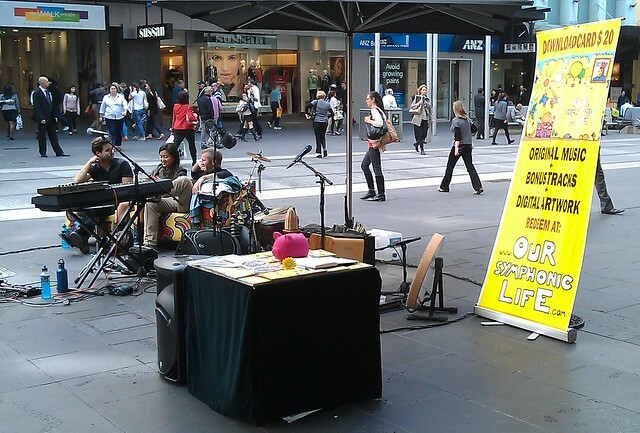 Meanwhile in the mall… Perhaps busking bands are moving away from selling CDs — instead they just sell you a token for an MP3 download. Yes, you don’t see “As seen on TV” very often these days. I guess the product was being marketed toward people who watch TV at certain times of the day (such as day-time or late-night) where they are bombarded by adverts for the product. Regarding the Download, presumably you need to trust the musician that the download exists on the web prior to forking our $20. At least with a CD, you have something physcial for your dough. Interesting about the downloads as to how old-fashioned it actually is. You pay your money as you do in a retail shop and then you get the token and then have the goods delivered. It’s a bit like some really old-style stores where you pay and get a voucher then take it to another desk and get your goods. There might even be a pneumatic shute along the way. If they were really up to date they would just take your twenty dollar note and then the music would magically appear on the device of your choosing at the same moment. For me modernity in purchasing is reducing the time taken from payment to delivery. Modern purchases are e-books, online top up of transport cards and ….fast-food. Even the logo of the ‘As seen on TV’ looks straight from the seventies. CDs – haven’t opened a case of one since moving house in 2008! 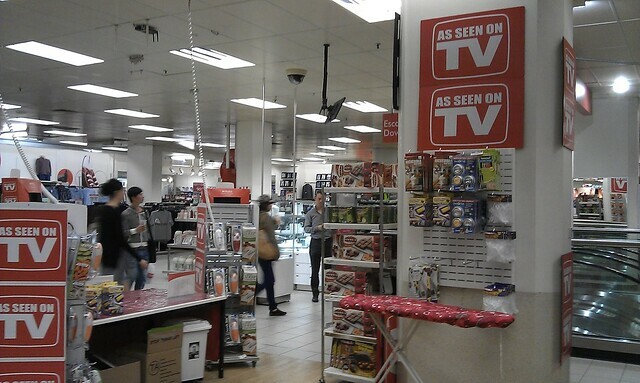 The whole ‘As seen on TV’ thing is actually really big in the US – there are even full stores dedicated to it in malls. Big W also seems to have recently rolled out a dedicated section to such items. Admittedly a lot of the stuff is junk, but sometimes you get the odd cool/useful item. As seen on tv? If you have to say it, you’ve lost. As seen on tv, like Apple product placement, actually works without the signs.